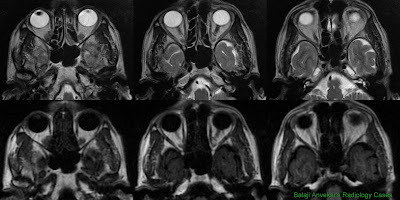 A 50 yo male with right orbital proptosis, painful eye movement and conjunctival congestion. A well circumscribed intra orbital focal lesion tear drop shape on axial sections , its narrower end towards orbital foramen. Bony floor of right orbit intact. No marked mucosal thickening in right maxillary antrum or adjacent ethmoid air cells. Region of naso lacrimal duct normal. Inferior and medial rectus normal. Mass is not arising from recti. Plane of this tissue appears to be partly intraconal and partly extraconal; as on axial sections it appears to be within the muscle cone but on coronal sections mild elevation of medial end of adjacent inferior rectus. No superior ophthalmic vein enlargement. This soft tissue is not arising from optic nerve. Optic nerve is mildly displaced by this tissue. No obvious bony orbital margin destruction. 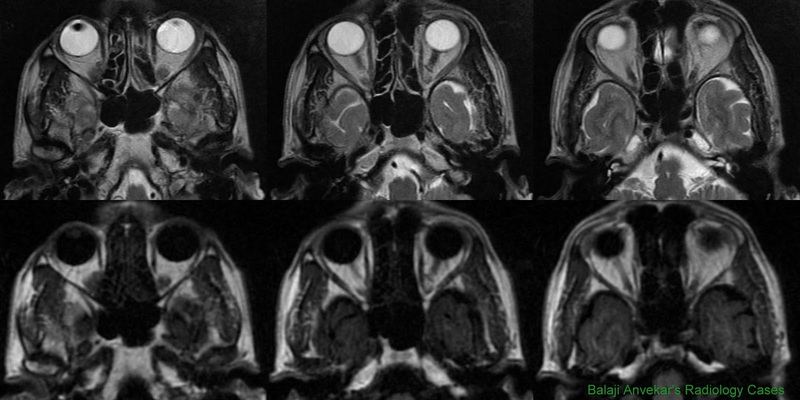 Intra orbital fat show normal density on CT and signals on MR. This MRI study shows marked regression in size of the lesion compared to previous MRI. Comparison of MR dated 19-Sept 11 with 29-Sept 11 show marked regression in size of the lesion in just 10 days. Meanwhile pt was on steroids. This narrows the list of differentials to Pseudotumour and Lymphoma - Both are known to respond to steroids. Short history of right orbital pain, painful eye movement and conjunctival congestion on clinical examination goes more in favor of Pseudotumour.